Oxford nestles between two rivers – the Cherwell and the Isis (the local name for the Thames), famed for providing the inspiration for Lewis Carroll’s Alice in Wonderland stories and the place where Oxford’s tradition of rowing began. 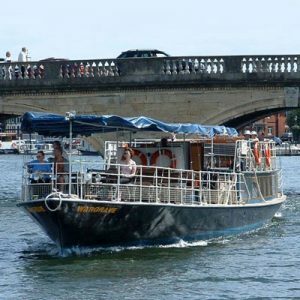 After your walking tour of the city why not take a relaxing boat trip on one of Oxford’s rivers? Take a Salter’s Steamer from Folly Bridge to Sandford (40 minutes each way) or Abingdon (two hours each way) and see Oxford from the river. You will pass Christchurch Meadows and the College Boathouses where, during University term-time, you may see the eights and scullers practising their rowing. You will see some of the beautiful English countryside which inspired Lewis Carroll to write stories about Wonderland for a little girl called Alice and her sisters. You will also pass through some of the beautifully maintained locks that enable pleasure craft, punts and Steamers to navigate the River Thames from Lechlade to London. A forty-minute round trip taking in some of Oxford’s finest riverside scenery, including Christ Church Meadows, The University Boat Houses and Regatta Course and the picturesque Iffley lock. A 2.5 hour round trip, including all the sights of the River Experience and taking in views of Iffley Lock and Port Meadow. This cruise includes a gourmet picnic lunch. Departs from Folly Bridge. A 2.5 hour round trip, including all the sights of the River Experience and taking in views of Iffley Lock, Osney Lock and Port Meadow. All the riverside places Alice used to go! Departs from Folly Bridge. To learn more about prices and timing for these crusies, please visit the Salter’s Steamers Website, where you will find further information as well as details on how to book. 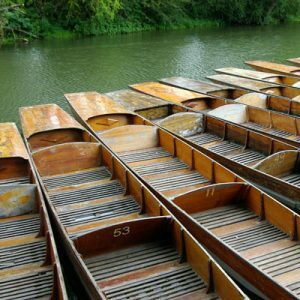 Try your hand at this curious form of boating which is particular to Oxford and Cambridge by hiring a punt and taking a trip along the River Cherwell or the Oxford reaches of the Thames. You will pass the University Parks and the gardens of several of the Colleges. You can take a picnic and stop to eat on the banks of the river or you can hire the punt for a whole day and punt down to a typical English Pub – the Victoria Arms – for lunch. Bottles of champagne and towels are advisable! 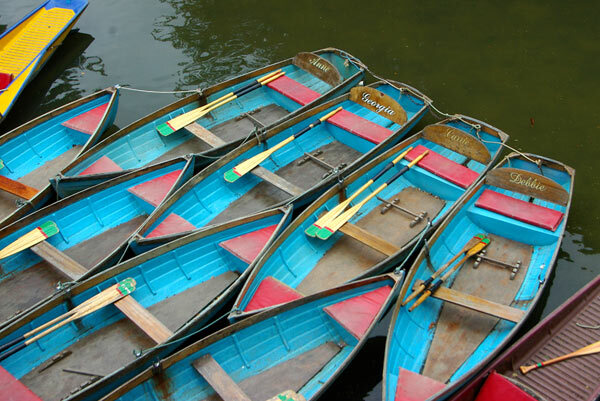 Punt hire is usually per hour, with space for up to five people (including one punting!). £22.00 per hour, 7 days per week, until one hour before sunset. To book, please email Magdalen Bridge Boathouse. £16.00 per hour, £80 per full day, Monday – Friday, 10am until dusk. Full day hire is available by appointment. Please call 01865 515978 or email the Cherwell Boathouse. An option for the slightly more cautious: Hire a punt which is chauffeured by an expert puntsman – just sit back, relax and enjoy the landscape. Don’t forget to bring some refreshments. The standard price for a chauffeured punt from Magdalen Bridge Boathouse is from £32 per half-hour for up to four passengers. 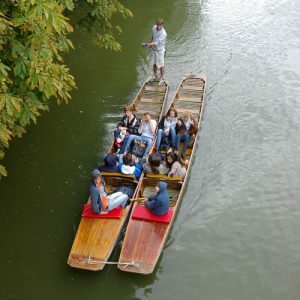 To reserve a chauffeured punt, please email Magdalen Bridge Boathouse. A very pleasant way to spend a leisurely lunch or a romantic evening. 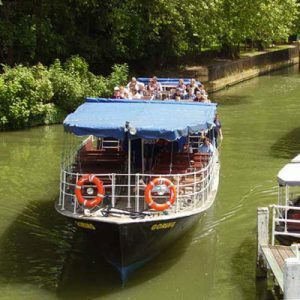 Hire a punt from the Cherwell Boathouse (5 minutes from City Centre) and spend one hour punting before having lunch or dinner at the delightful and extremely popular Cherwell Boathouse restaurant overlooking the river. The Cherwell Boathouse can also supply picnic lunches for those hiring punts, with prices starting from just £9.50 per person, and Afternoon Teas are available, by appointment. 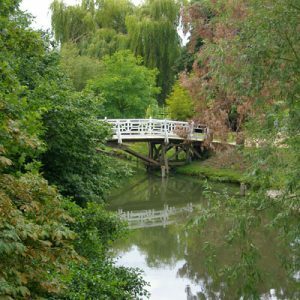 Restaurant reservations: Telephone: 01865-552746, or visit the Cherwell Boathouse website. Please note: All details, including timings and prices, are subject to change, and are offered here merely as a guide and indication. Please check with the individual companies concerned if you wish to make a booking, or to determine exact times for availability and confirmed costs. Cruises on the Oxford Canal also available – Please ask!